Note: Some children have better social skills than other, however, those with better social skills have enhanced opportunity in life. Time spent on social skill enhancement is time well spent. Once social skills have been identified, break students into groups. 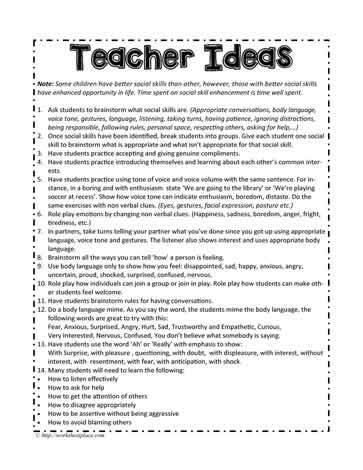 Give each student one social skill to brainstorm what is appropriate and what isn?t appropriate for that social skill. Have students practice accepting and giving genuine compliments. Have students practice introducing themselves and learning about each other?s common interests. In partners, take turns telling your partner what you?ve done since you got up using appropriate language, voice tone and gestures. The listener also shows interest and uses appropriate body language. Brainstorm all the ways you can tell ?how? a person is feeling. uncertain, proud, shocked, surprised, confused, nervous. Role play how individuals can join a group or join in play. Role play how students can make other students feel welcome. Have students brainstorm rules for having conversations. Very Interested, Nervous, Confused, You don?t believe what somebody is saying. With Surprise, with pleasure , questioning, with doubt, with displeasure, with interest, without interest, with resentment, with fear, with anticipation, with shock.